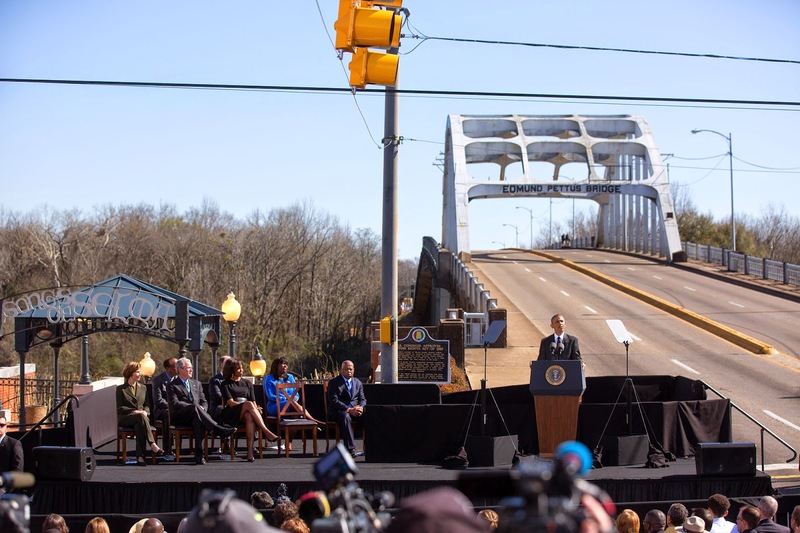 Aside from two First Ladies, she was the only woman speaker on the podium to honor the civil rights "foot soldiers" 1965 march across the bridge in Selma, Alabama. U.S. Representative Terri Sewell, a Selma native and its Member of Congress, set the tone and the stage for the day's high-profile speakers: Rep. John Lewis, one of the original marchers, and President Barack Obama. There is still much work to be done. In fact, it was Amelia Boynton, 105 years old, who was my special guest at the State of the Union. As many people passed her in the hall, they would say, "Mrs. Boynton, we stand on your shoulders. We stand on your shoulders." Mrs. Boynton said, "Get off my shoulders! There's plenty of work to do!" So I say to you, America, there's plenty of work to do. You can see in the video below that this left the President laughing, always a good marker of success for a speaker. Now I have the great honor of introducing someone I did not know how to address when I first came to Congress. Do I call him colleague? Do I call him Congressman Lewis? Do I dare call him John? He is a civil rights icon, and a little black girl who grew up in Selma stands in his shadow. It is because of you, John, that so many of us get to walk the halls of Congress, get to sit in the Oval Office. It is because of your bravery and the bravery of those foot soldiers that I get to be Alabama's first African-American congresswoman. To say thank you is not enough. Let me just say, we know we have unfinished business, John, and we know there is much work to do. Keep an honest balance: In commemorating the horrific day known as "Bloody Sunday," every speaker at the anniversary needed to balance honoring the past while not suggesting that all discrimination has ended. Sewell chose to do this effectively with the voice of one of the women foot soldiers, still impatient for change. In doing so, she added a note of humor and catharsis to the day's speaking, and avoided too much sentimentality. Include yourself in your remarks: Sewell puts herself into her remarks throughout this short speech, without sounding self-aggrandizing. She does that by making herself a living marker of progress, noting that she grew up in Selma without segregation, and her achievement of getting elected as the state's first black congresswoman. As a bonus, including her unique perspective meant her remarks would not sound like a copy of anyone else's--and yielded the laugh line of the morning. Even the lowest-ranking speaker should have a great speech: Some might think it's their job not to outshine anyone else on the platform, and that would be hard to do, anyway, with two presidents, two First Ladies and a civil rights icon sharing the stage with you. But Sewell gives her speech as much care and attention as if she were the only speaker that day, and it paid off. Check out the video of her speech at the link below.